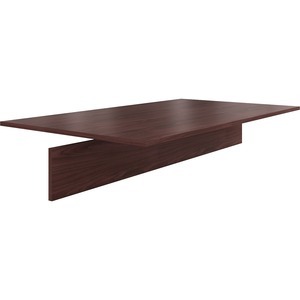 Adder section extends the length of boat-shaped conference tables in the HON Preside Laminate Conference Series. 6' extension section easily fits in the modular tabletops (sold separately), giving you the flexibility to infinitely expand your conference table as your company grows. Adder features a traditional edge and durable Mahogany laminate that is easy to clean and scratch-resistant. The abrasion-resistant, stain-resistant, thermal-fused laminate covers a durable, 1-1/8" thick, solid-core, high-density particleboard that resists warping.